This program allows you to take Fresh Pizza and bake them in about 20 minutes when everybody is home. Hot, Fresh, Baked Pizza when your Ready! For only $7.99 you can become a TAKE N’ BAKE Member! Save up to 17% from the hot menu pricing! 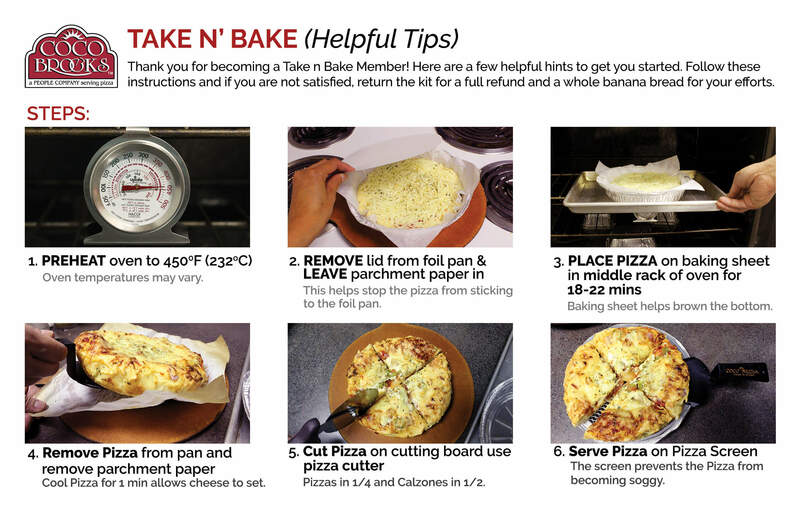 We require everyone to one(1) time buy a Take N’ Bake Kit to easily learn how to bake Pizzas. Pizzas are thick and this large cutting wheel makes for cleaner cuts/slice. Pizzas are placed on screens to keep them hot and dry. Used to easily serve pizza. Some directions to help you through. Our goal is for your 100% Satisfaction. If you’re not happy with the Take n Bake kit, return it and we’ll give you your money back and a Banana Bread Pizza for your troubles. This helps stop the pizza from sticking to the foil pan. Baking sheet will help brown the bottom of the pizza crust. Some Bake time for pizzas vary. Who likes a burnt pizza? The screen is used to help keep pizza hot and dry. Be careful not to burn your tongue.